Flexicon Nylon (PA66) Straight PG Thread Fittings - Bolt Products Inc.
For use 1/4 thru 2" Flexicon corrugated conduit/tubing. Nine PG threaded choices for use with eight different conduit sizes. 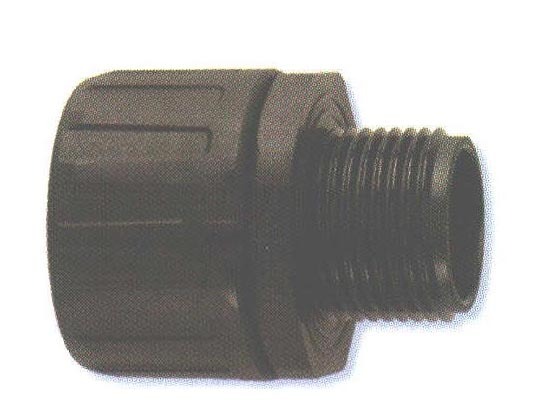 Suitable for use with both fine and/or coarse pitch conduit/tubing. Unitary design and assembled shipment allows fast fit. All nylon construction resists salt water, weak acids, gasoline, alcohol, oil, grease, and common solvents. This feature is not assessed by UL certification or testing. No threading of the conduit/tubing is required to install. Suitable for use by all original equipment manufacturers. Protection class IP 66 per EN 60529 including high pressure water jet from any angle. Vibration and tamper resistant, but easily removed with a screwdriver. Consult factory for FPAX fittings for use in IP 68 or 67 (as well as 66) applications.